Series 2 Duo-Cloz Manual Washing Machine Shutoff Valves are used in washing machine applications to manually control water flow and pressure from the hot and cold water supply piping to the flexible hoses feeding a washing machine. It prevents the washing machine hoses from bursting preventing water damage in the home. 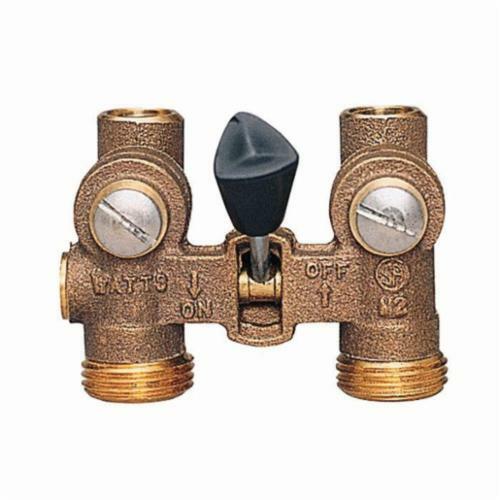 It consists of a brass (Models 2-M2 and 2T-M2) or satin chrome (Models 2-M2-SC and 2T-M2-SC) body construction, and a single DuoCloz lever to control shutoff of both hot and cold water supplies. Models 2-M2 and 2-M2-SC have 1/2 in solder or 1/2 in compression connections. Models 2T-M2 and 2T-M2-SC have 1/2 in NPT male threaded or 1/2 in solder connections. Series 2 has a throttling feature that minimizes the shock effect of quick-closing washing machine solenoid valves. Maximum Pressure: 150psi.